Respect the environment and preserve its natural resources is part of the working methodology of Brasfond Group. We believe that through our attitudes and conscientization of all we conserve the environment we live in. With an effective Environmental Management System, in 2014 Brasfond received the ISO 14001 certification, which recognizes the balance between maintaining profitability and reducing environmental impact. 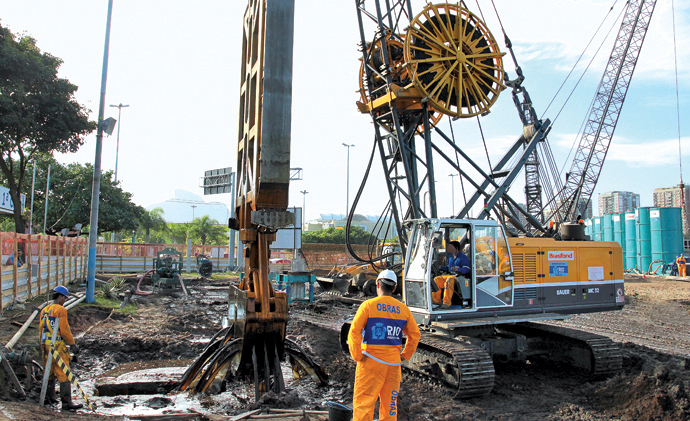 In accordance with our strategic culture of environmental preservation, the Brasfond Group holds exclusive rights in Brazil to use a polymeric substance for the stabilization of drilled excavations. Granulated polymer/ Polymer ready for use/ Polymer being used in soil excavation. Non-toxic and inert, this synthetic polymer brings no harm to the environment. The waste product from work using the polymer requires no special treatment or storage. Execution of a "T" shaped diaphragm wall with the use of polymer. Constantly aware of our environmental responsibility, Brasfond has installed a complete system of wastewater treatment at our operational center, enhancing the reuse of water drained while washing our equipment. As well as reducing consumption, removed oil and grease are then set apart for an eco-friendly finality.